"You're part samodiva. I knew that when I met you. It's in your blood to be distracted by beauty...and pleasure." He turned to face her, taking in every sensuous curve of her female form. "You seem to have forgotten that it's in my blood as well. Whatever shall I do to remind you?" Scandal. Blackmail. Obsession. It's just another day if you're a Marinossian. When Annika disappears without a trace, Talvi launches the hunt for his most infuriating rival yet. His only clues are from a government he's increasingly at odds with. In exchange for access to their resources, he does the unthinkable and reveals Annika's true nature. Time is short, but the list of names Talvi can trust keeps getting shorter. Back home at the family's country estate, his brother Finn is blindsided when the missing redhead turns up injured with no recollection of how she arrived. While his mother tends to her physical wounds, Finn's given the task of restoring her memory...and he just can't resist showing her his version of the truth. But playing mind games is like playing roulette - and someone's luck is about to run out. I didnt see that comming!! Where does The Scarlet Tanager rank among all the audiobooks you’ve listened to so far? I think this is the best book in the Annika Brisby series. It is if those first two books build to this one. What was one of the most memorable moments of The Scarlet Tanager? I cant say much about it, but the end of the book. What about Nick Cracknell’s performance did you like? 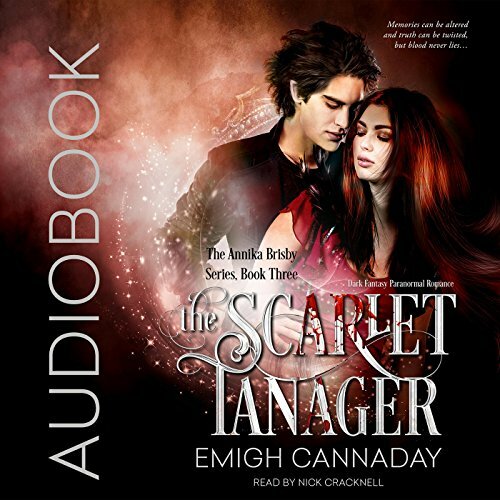 I was very happy to hear that Emigh Cannaday used the same narrater as she use for the first book (The flame and the arrow) in 'the Annika Brisbey' series.The narrater, Nick Cracknell has a nice voice. He is easy to listen to. Sometimes a bit monotome, but certainly very clear. His pronounciation is very good. The sound quality is also good. it was nice and clear. Nick Cracknell's acting skills brought the characters to life. When Annika went dancing in the village, also when Annika and Talvi got together again and my more. ** spoiler alert ** This review is based on an audiobook that I received. It is an honest review and the complimentary receipt of it in no way affected my review or rating.This book started off with deception, action, and a sinister villain. It then went for a ride into the realm of appalling. Honestly, poor Annika! Then with another twist to the story, past actions comes back to haunt Finn and confuse Annika. This book was truly wonderful. This story is told primarily from the perspective of Finn. Annika is a huge part of this book but suffering from memory loss she is fighting her way to the truth.Talvi’s older brother and he has always been a big brother to him even if he did not condone his actions, until Annika. Throughout the series Finn has found himself torn between his feelings for Annika. In this book we are seeing a whole new Finn. He is obsessive and has become very unhealthy and dysfunctional.In my previous reviews I have always felt that Annika needed to grow up a little and I am really wowed by her development in this story. Some may argue this point due to her behavior, but she had very few memories that were clear and she was being influenced by Finn who had some very strong feelings on the subject of her marriage to Talvi.I however felt that Annika was trying to figure out everything. Especially her marriage to Talvi had been something that was not filled with joy and wonder. They actually had very little time together and their relationship started off on the wrong foot. When they did finally have a break-through she was ripped away in the worst way possible. I feel that by the end of this story that an entirely new Annika had emerged.I kinda missed Talvi in this book. Especially beause he did his damnest to find wife.In the end it turned out to be ok. I love what occurred when Talvi and Annika were brought together again. It was really wonderful, touching, and made my heart soar. But then…..The last chapter happened and I was left in a wretched state of disbelief. Disbelief at what happened between the brothers and I was absolutely with Talvi as he screamed: “No! No! NO! This isn’t HAPPENING!”Yep, right there with you brother. I am still reeling from what occurred and all I can say is “please say it isn’t so!” Wondrous addition to the series! I highly recommend.I hope I dont have to wait very long for the next book in the series. I think that something happened in the end, but im not sure if im right. I hope I am.I received this audiobook in exchange for an honest review. Would you consider the audio edition of The Scarlet Tanager to be better than the print version? I read this book first, then listened to it... I usually get more out of a book when I listen to it... The story seems to come alive in audio format. This book seems like it will be a turning point for these characters.. whether good or bad we will have to wait and see.... But things are definitely changing for these characters. I love how Emigh writes her and her details are amazing without being overbearing. There's so much going on in this story, but its not over-whelming. I love listening to Nick as he reads. There is so much emotion and growing and changing throughout the story I can never decide what I like best or even if there is anything to not like. I'm blown away by how awesome this series is so far and can't wait to continue on. I would rank it above Silver Thread, but below Flame and the Arrow. Talvi's and Finn's father Ambrose. Many of the characters behave badly in this novel, and Ambrose isn't having any of it. He puts his foot down and reminds them what is appropriate. Have you listened to any of Nick Cracknell’s other performances before? How does this one compare? Yes, this one was just as fantastic as the others. Nick is fantastic with different accents and inflections. He makes each character's voice unique. This book begins right where the previous book ended - with Annika being kidnapped by a doppleganger and Talvi close on her heels. After a harrowing experience as a vampire blood slave, Annika just barely escapes with her life. While Talvi is searching for answers, his twin sister finds Annika and delivers her to his family. Under the loving care of his brother Finn, she begins to recover, but the vampires have wiped her memories, and she doesn't remember Talvi. As she grows closer to Finn, they fight the growing attraction that threatens to tear the family apart. This entire story is told from the third person point of view. Most of the chapters focus on Annika's story, but there are occasional glimpses into the lives of other characters - not just Talvi, but other more minor characters such as Hilda and Nicola. It really made the world feel full, and kept us engaged not only in Annika's plotline, but in everything going on everywhere in this wonderful world Emigh Cannaday has created. I had originally thought this was a trilogy, but I am very excited to discover that I was wrong, and I can't wait until the next book is released. I just can't even. This whole series has thrown me through so many loops. I can't believe it's... just wow! Great series! Fully recommend! This book was more than tolerable and I actually enjoyed it. Except for the fact I was angry most of the book because of her wanting Finn and the way nobody did anything about it. Drove me CRAZY!!!! Enchanted Yet Again For A Third Time!!! Nick Crakell has done a wonderful job yet again narrating Emigh Cannaday's third book of The Annika Brisby series. I was once again swept away by this enthralling story which picks up right where we left off in book two. With a rollercoaster of emotions, twist and turns. As well as lots of and loss and one crazy cliffhanger. Can't wait for installment number four. Also I would like to give a big THANK you to Emigh Cannaday for letting me be apart of her audio book review team!!!! I loved the first books in the series bit this was by far the best yet. Beware of twists and turns, plus a major cliffhanger. This was my least favorite of the three books. Not sure if I will read the next book. I like the narrator but I'm in agreement with our lead character in that something's are better left unknown.